Undoubtedly you have heard about the optional lease extension. There is a lot of discussion in the Mini-E community about disappointment in the $650 price. Many were hoping for < $500. I am not sure how each person came to that but I can say for me, I was pretty doubtful at $450. And the deal that was offered didn't change my mind so with a somewhat sad heart, I will be returning #148 in June as planned. Don't get me wrong. I still love the car. It is a blast to drive and for me totally trouble free. I wasn't one of the ones griping about the price originally. I knew what I was getting into. It was a value proposition for me. As I have said here, I wanted to learn if the car worked for me without spending the $25-$110K I would need to buy one right away. Makes sense to me. I learned a ton. I was a believer in abstract before but now am all in and am ready to buy. Let's be clear. For most of us, financially, this deal really never made sense. I own a Prius and another Toyota outright and my commute is fairly short at 50 miles RT. And we have had to occasionally drive our other cars for room + going out with friends. I could never make up the $ in the year compared to the cost of ownership and gas in my existing cars. So there has to be something more. Learn about myself and help push the movement forward if possible. Mission accomplished from my perspective. 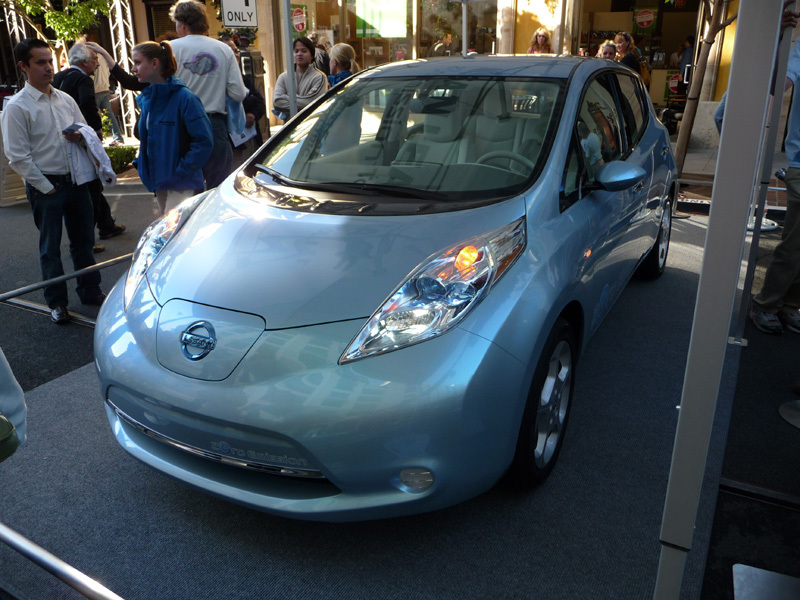 I learned and look there are commercial EVs on the way. I am bold enough to say we had a small part in that. So I have decided like others I think to save that ~$9k a year to buy an EV in the next year or two. That way I get a car for life that I can hack around on, fill with junk and enjoy. I learned what I needed to from this. If Mini really wanted me and others to stay, they could have made it make financial sense for us. An extra couple hundred dollars for each of the 400 car out there could not have made any difference to them. It was strategic on their part and so I really don't feel any pangs of loyalty or regret. It was just business. It was fun and I really enjoyed it. But Mini/BMW had a shot for a customer in the next round and for me, they missed it. I'm looking elsewhere. For me Nissan, Chevy, Mitsubishi and others are coming and I couldn't be more pleased. Heck, even the aftermarket price of Rav4-EVs seems to be coming down now that reality of commercial EVs is here. I wouldn't mind picking one of those up for the right price. Let's check out the cars. 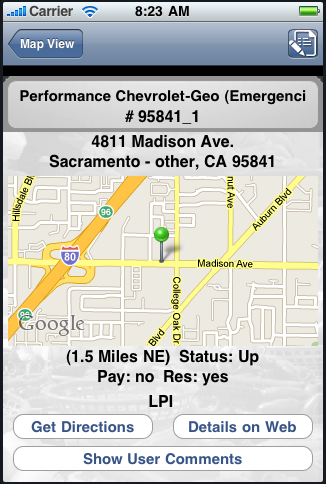 PS: I will be retaining the website and keeping up the EV Charger Finder iPhone app. I may not be able to us the chargers still for a year or so, but I will soon, and I want those chargers to be ready. You can now set a custom point on the map where it considers all the distances relative to instead of using the GPS location of the phone. To use this feature, select the Purple pin on the top of the map view, then tap anywhere on the map. To clear the custom location, just tap the purple pin at the top again. You can also view the User "I was there" comments direct in app now. 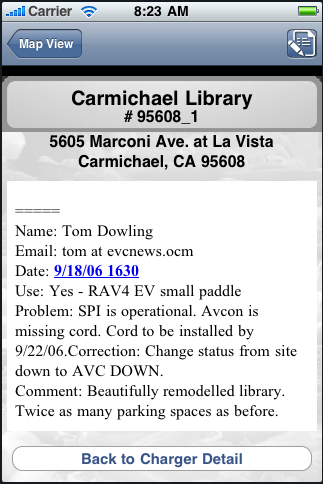 From the Location view screen, select "Show User Comments" to see the comment view. Let us know what you think and if there are improvements you would like us to make via the Contact link at the top of the page. 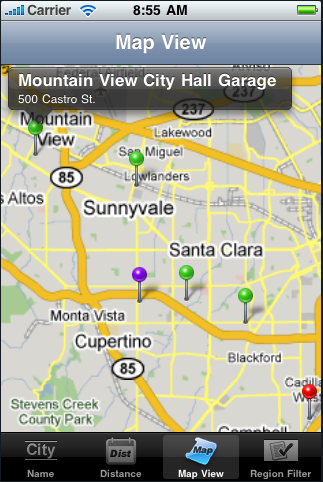 Our EV Charger Finder iPhone application has been released into the Apple App Store. This is your guide to Electric Vehicle Charging Stations. 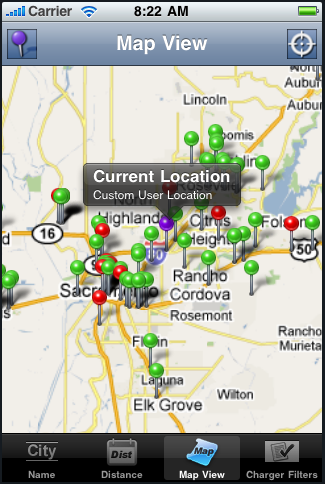 In association with the www.EVChargerMaps.com website, we present a hand held application for locating public charging stations for your electric vehicle. - Includes a local database of over 500 public electric vehicle charging stations, the type of connections available, and geographic position. Does not need to sync to web to get data. - Charger location can be updated via the www.EVChargerMaps.com website. Contribute to this growing community. - Filter by Geographic Region to only show markets in your area. Also filter by the kind of charger adapter you need (LPI, SPI, Avcon, Telsa, or Other). - Detail view with information about the individual charger. You can also launch google maps to get directions to the location. You can also link to up to the minute reports on each charger via the website. - Email a Market Update direct from the application to the website. The majority of the chargers listing are currently in California, however, the system supports worldwide data and we are working to rapidly expand the coverage. Please bring your MINI E and join us and other MINI E test drivers for lunch at Cisco Burger in Long Beach. It's September 20th from 12-2pm.